The Technology District sponsored the 4th National Sensors Convention, organized every two years by major scientific societies in Italy and hosted, for this edition, in Catania from 21 to 23 February 2018 in the prestigious headquarters of the Diocesan Museum. On 22 February, Francesco Priolo, President of the Sicilian Micro Technology District and Nano Sistemi, spoke at the round table, dealing with the topic of Sensing in the Micro and Nano Sistemi Technology District. 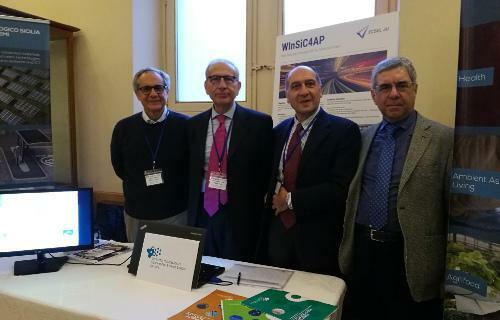 In the Poster session, the poster and the presentation of the WInSiC4AP project Wide band gap Innovative SiC for Advanced Power (2016 ECSEL RIA Call) were shown; present Leoluca Liggio, Antonio Imbruglia and Salvatore Frisella.